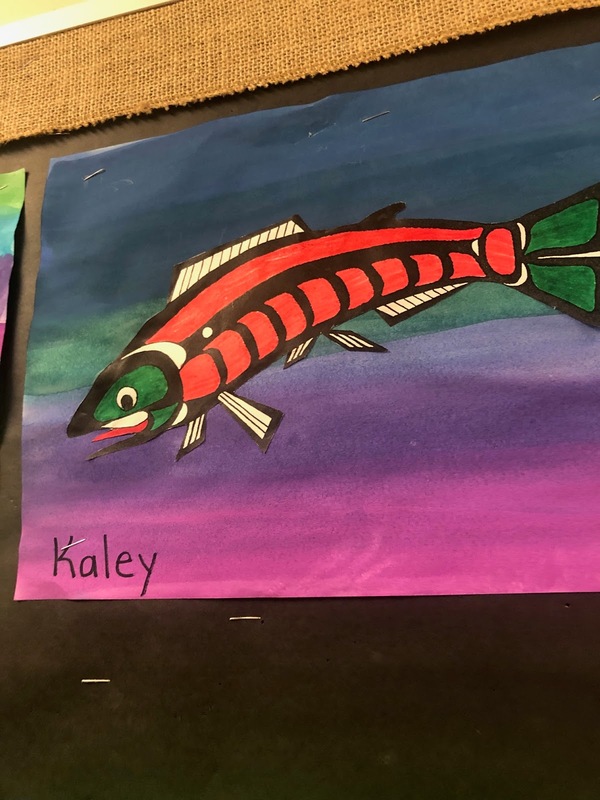 This week we went to see a play called "Salmon Girl". 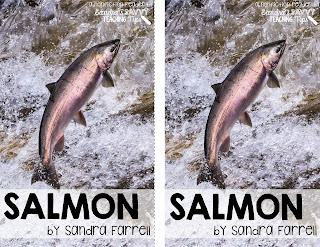 It's a story of an Indigenous girl who becomes transformed into a salmon. 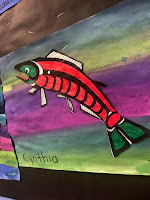 It turns out that she is one of the Salmon People who's job it is to keep the salmon in the river safe. 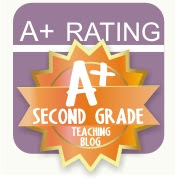 The entire play was perfect for Grade 2's. If you get the chance to see a production of this play, I highly recommend it. 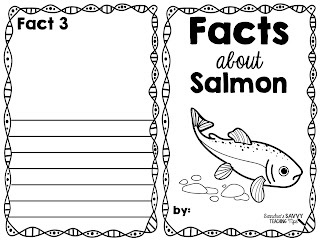 So as a lead up to the play we did a quick, one week unit of study on Salmon. I saw an activity on Pinterest called Sunset Salmon from GradeOnederful.com and I decided to try my own version of this. First I found an image on the internet. I used this artists' work here. I copied it out and took out the colour. 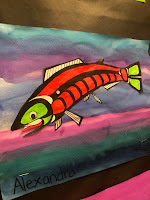 Then I had the kids colour in the salmon with markers so that it was bright and bold. Then the kids cut them out. 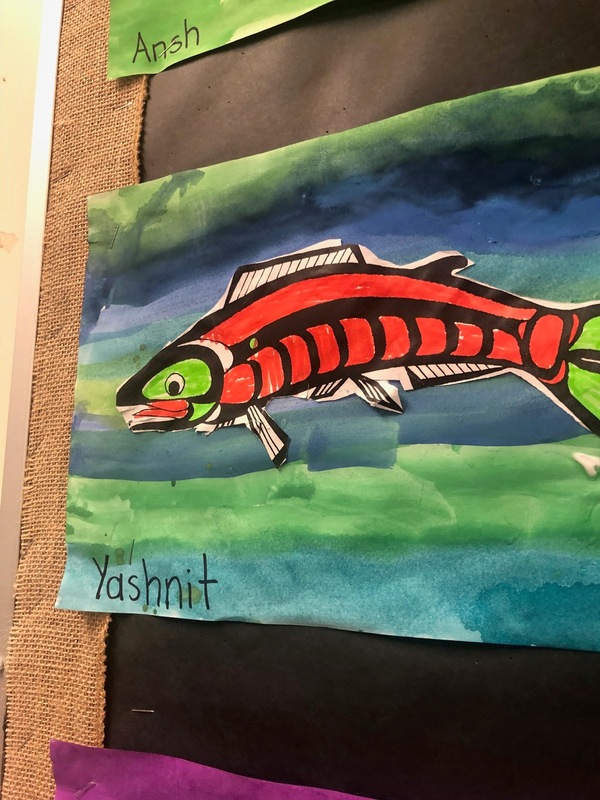 Next we used tempera block watercolors and painted the background stripes. 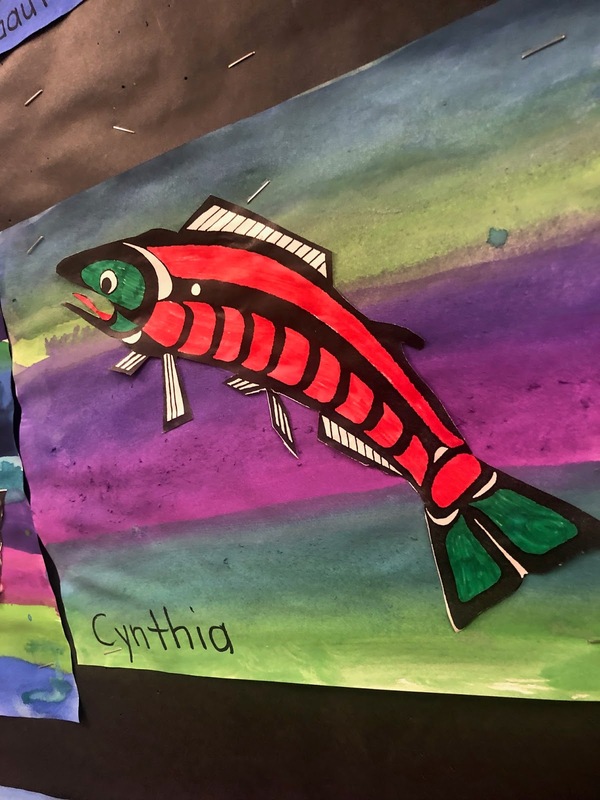 We used only cool colors to evoke the coolness of the water that salmon live in. 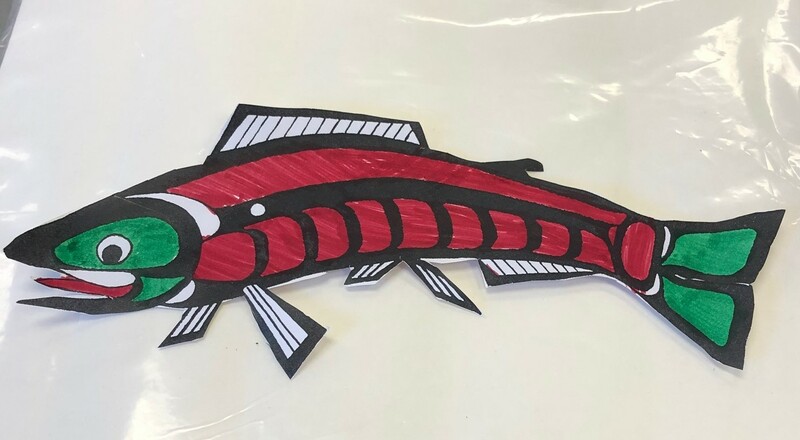 Then we glued the cut out salmon on top. And here we go, a beautiful bulletin board. 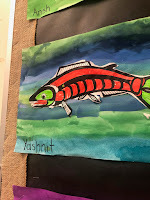 Then we worked on a mini Salmon research unit. 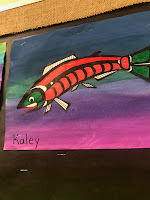 I posted their final results below the salmon paintings like in the photo below. 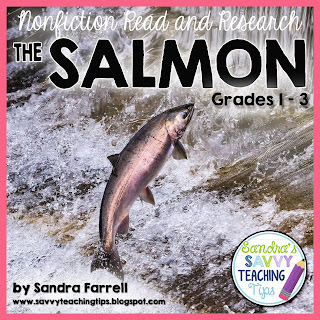 We used my Salmon Unit which is available from my store HERE. 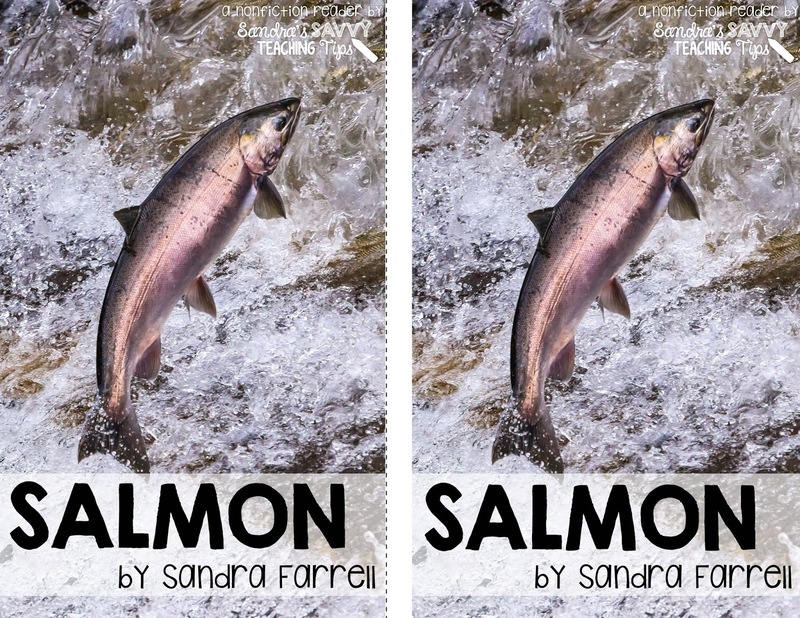 This package includes a 6 page, full color, non-fiction mini book. I printed them out in B&W at school, to save money, and I gave each child their own copy. 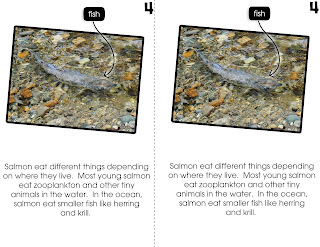 Now this book is at a reading level which is more difficult than most Grade 2's can read. So we read the whole book out loud together first. Here's an example of one of the pages from the book. After we read it together, the next day I asked them to read it by themselves. I explained to them that they didn't need to understand every word, but that they were looking for information in the text and that I wanted them to try to focus on what they DID understand. They used the worksheet above to take notes. 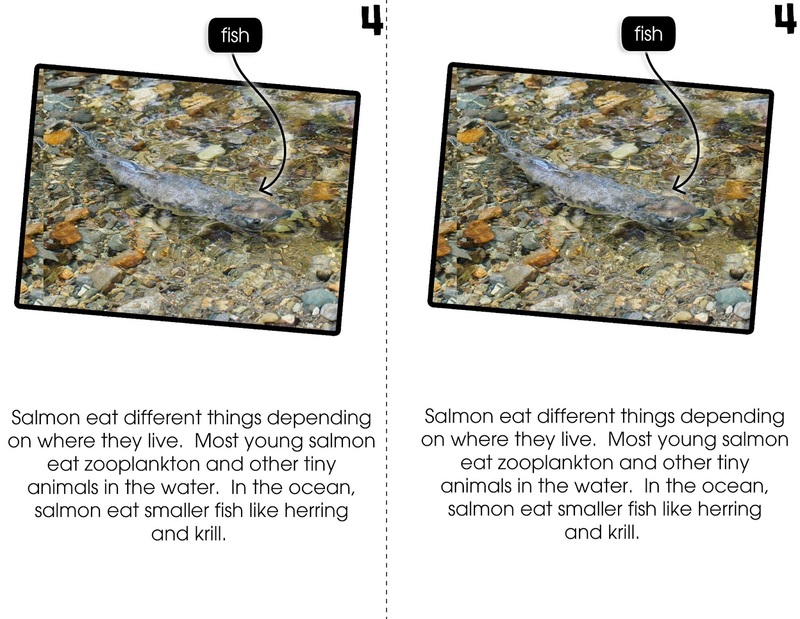 Each page of the mini book aligns with one of the speech bubbles above. It's really easy for them to find ONE fact to write down in the bubble for each page. Then I had them complete the mini booklet above. 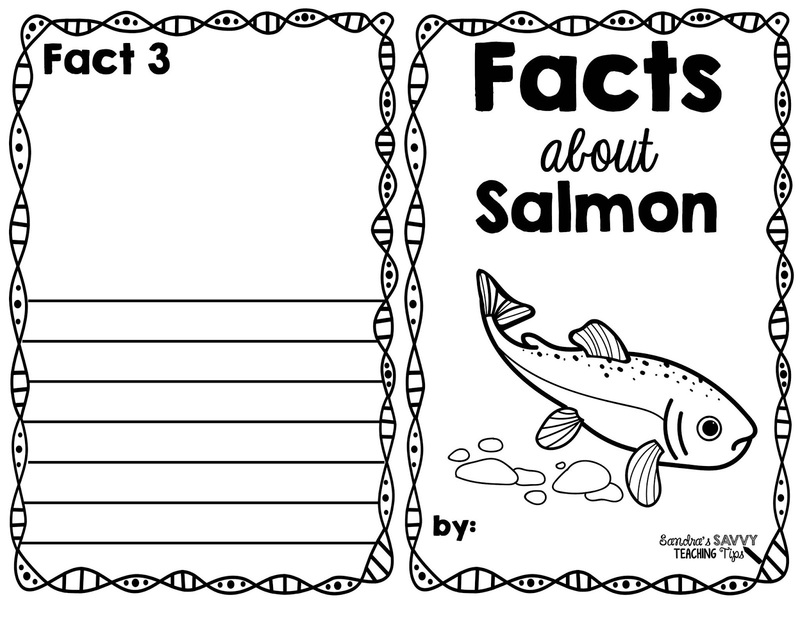 In this booklet they first wrote down one fact on all 3 pages. 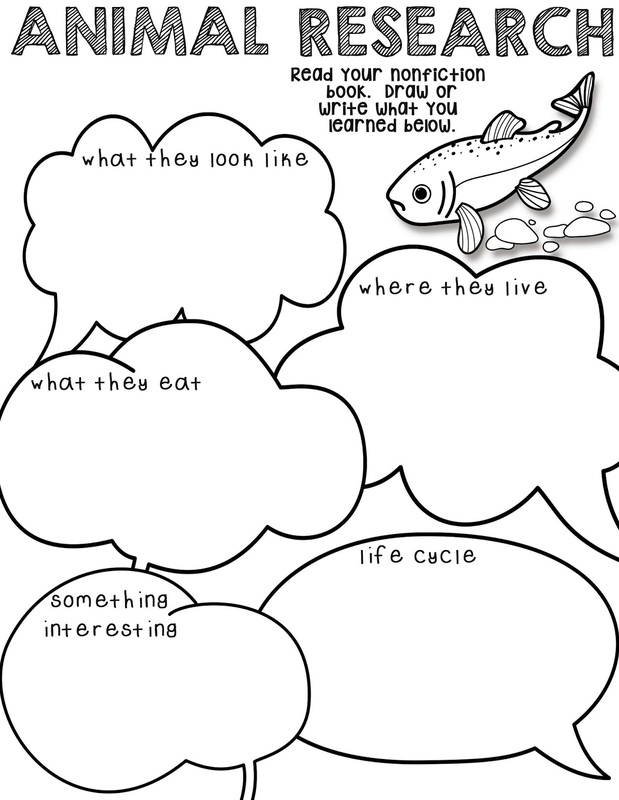 They chose facts from the ones they had gathered in the speech bubbles. Then they came up to my one by one and I helped them expand on them. So for example. 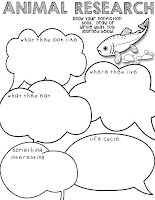 If the child wrote, "They live in fresh water." I would ask the child, what other kind of water can they live in. The child would naturally answer "oh, they can live in salt water." So I would tell them, "Can you write that down? They can live in salt water too." And then would go back to their desk and add another sentence to that fact page. In the end they came up with some wonderful books of facts. 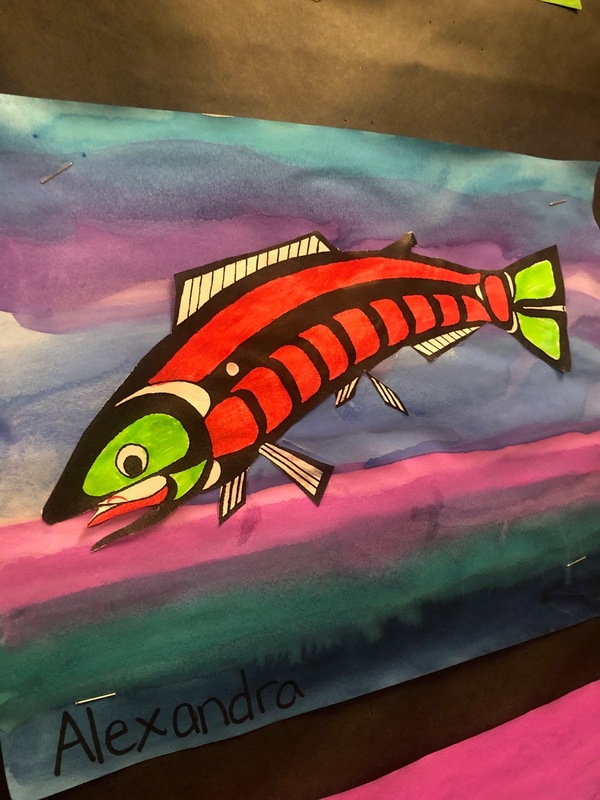 They also did a great job of drawing and coloring too. Here are some examples. I just love the little pictures they drew and the labels they added.